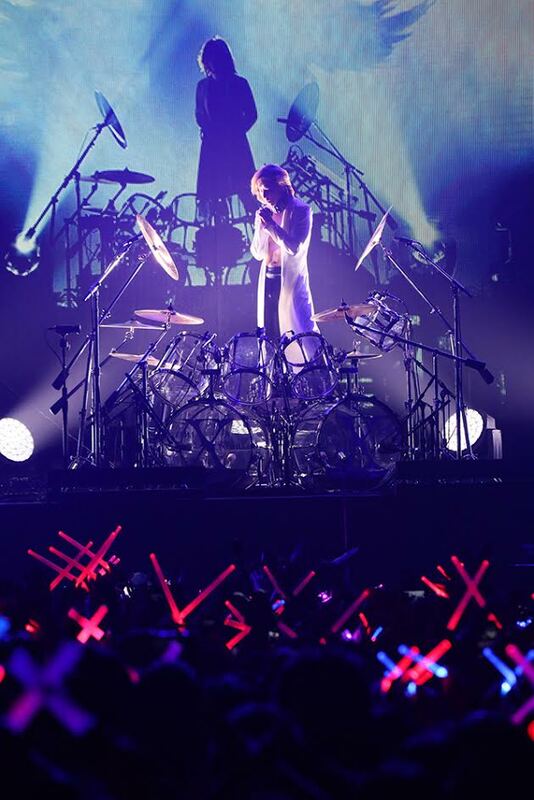 YOSHIKI RETURNS TO THE DRUMS FOR 10TH ANNIVERSARY OF X JAPAN'S REUNION AT COACHELLA! X Japan drummer/pianist YOSHIKI performed his first full concerts on drums following last year’s emergency spinal disc replacement surgery on April 10 and 11 at Zepp DiverCity in Tokyo, warming up for the band’s debut performance at Coachella tonight, April 14. At the sold-out, back-to-back shows — titled "X JAPAN LIVE 2018: 10th Anniversary of Reunion PREMIUM GIGS – YOSHIKI Night of Resurrection" — YOSHIKI’s intense drumming, including hard-rocking songs like "Jade", "Rusty Nail", "I.V. ", and "Kurenai", led the 2500 fans into a powerful moment where the entire venue "X-jumped" together as one. Richard Fortus of Guns N’ Roses, Wes Borland of Limp Bizkit, and Miya from MUCC joined the stage as special guests, adding more speculation about who might join X JAPAN on stage at their Coachella performances. While Yoshiki’s neck has not yet completely recovered, it did not stop him from stage-diving into the crowd to join the celebration. The gigs marked 10 years since the band last held a solo event in a Tokyo live house (the most recent being the Akasaka Blitz event in 2008). Only a few lucky fans got to experience the "YOSHIKI Night of Resurrection", held in an intimate venue roughly 1/20 the size of the Tokyo Dome. The concert was also broadcast live broadcast in cinemas throughout the Japan and around the world in Hong Kong, Taiwan, and South Korea. Just hours before the main event began, the good news that Sugizo’s visa was approved in time was announced to the crowds at the venue. Immediately after the final Tokyo show, X Japan flew to America, were all seven members of the band (including holograms of Hide and Taiji) will appear to headline the Mojave Stage at Coachella 2018.